President Obama and Arizona Rep. Gabrielle Giffords met today at the Kennedy Space Center in Florida, hours after an equipment failure delayed the launch of the space shuttle Endeavour, which is commanded by Giffords' husband, Navy Capt. Mark Kelly. Obama, who had planned to attend the launch, spent approximately 10 minutes with Giffords, according to a press pool report. It is the second time he has seen Giffords, 40, since a gunman shot her in the head during a shooting rampage in Tucson in January. It is the first time Giffords and Obama have spoken since she left intensive care. Before going in to see her, the president and Kelly greeted each other in a corridor. "I bet you were hoping to see a rocket launch today," Kelly said. "We were hoping to see you," Obama replied before giving Kelly a hug. Kelly updated the President and First Lady on his wife's condition before they met with her together. Obama later met with Endeavour's full crew of six astronauts. The launch was scrubbed three hours before liftoff after NASA identified a failed heater in one of the shuttle's three auxiliary power units. The agency said the launch will not take place for at least 72 hours. "Congresswoman Giffords is disappointed that Endeavour was unable to launch today, but realizes that mission safety must come first," her office said in a statement on Facebook. "We are looking forward to the quick rescheduling of this scientifically important mission. The congresswoman was pleased, however, to have been able to meet with President Obama and the first family. Her travel plans at this time are undetermined." Giffords is expected to resume her rehabilitation at TIRR Memorial Hermann Hospital in Houston as soon as possible. It's unclear how long will be able to remain in Florida. "She is very excited to not only be here...but to also be out of the hospital," Giffords' brother-in-law astronaut, Scott Kelly, said in an exclusive interview Thursday with local ABC News affiliate KTRK's Kevin Quinn. "I can't think of the exact words but it's very important to her...she is very excited about it." The Arizona Congresswoman was seen publicly for the first time since the shooting when she boarded a small NASA plane earlier this week to travel from Texas to Florida. She appeared fragile but determined, walking under her own power slowly up the airplane steps. Giffords' trip to Florida highlights the extraordinary journey she and her husband have been on over the past three months, and it marks the fulfillment of what friends said was a major personal goal on her road to recovery. "Her attending the launch is a goal that we were working toward, and we have achieved that end," Dr. Gerard Francisco, lead physician of the hospital's brain injury rehabilitation team, said in a statement earlier this week. "She has made remarkable progress in her rehabilitation, and we saw no reason why she could not travel safely to Florida." On Monday, Giffords' staff said the congresswoman had just started learning details of the shooting that injured 13 people and killed 6, including federal a judge and a nine-year-old girl. "She is starting to walk, talk more every day, and she is starting to process some of the tragedy we all went through in January," Kelly, 47, said during a pre-launch briefing. "Despite that, she remains in a very good mood, she spends most of her day in therapy, and enjoys brief visits from friends and colleagues." Following the shooting, Kelly faced a terrible decision over whether he could still pilot the mission, the second to last flight of a NASA shuttle, or would be wiser to stay at his wife's bedside. As Giffords began showing marked improvement, he decided to fly. The crew of Endeavour is wearing blue bracelets in honor of Giffords, and when Kelly reaches space, he has said he will read a personal note from his wife. The crew will also wake up to a song chosen by Giffords. Giffords attended in 2006 and 2008, the last times Kelly flew shuttle missions. ABC News' Russell Goldman and Gina Sunseri contributed to this report. 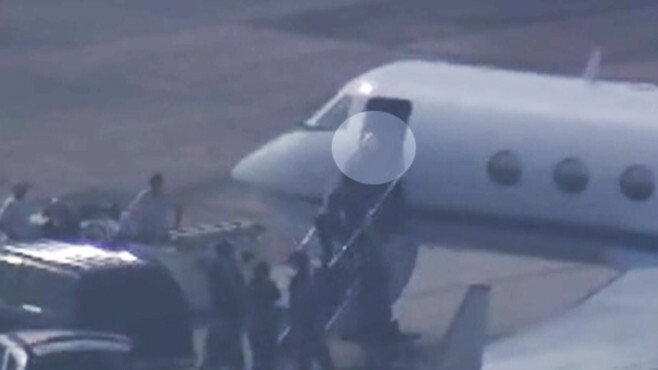 +Shuttle Crew, Giffords' Husband Arrive in Fla.